Several Moscow streets have been impassible all day on July 17 - but not because of the notorious traffic jams. They have been sealed off temporarily to become the realm of the fast and the furious. Even the heavy rain could not stop Formula 1’s cars from speeding past the Kremlin – a sort of rehearsal for the F1 Grand Prix, which Russia will host in three years' time. Television's Top Gear team were also there to kick it all off, or rather push it off, as they sent an unlucky Nissan plunging 70-meters at the end of a bungee rope. There was someone inside – a female member of the audience who was well-strapped in. Both woman and machine emerged unscathed. 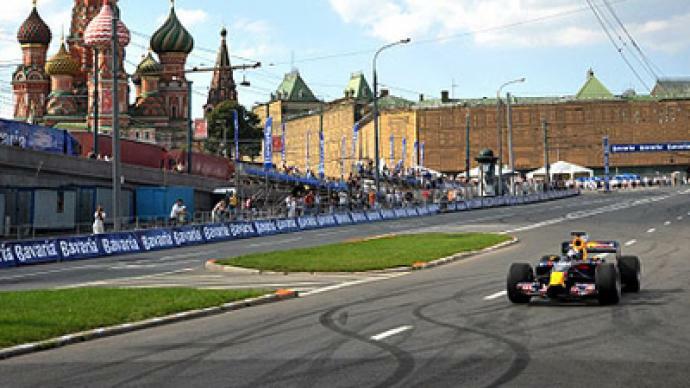 Moscow City Racing is an annual show – every year international teams take part in Formula 1 auto racing. This year race cars of McLaren, Scuderia Ferrari, Team Lotus and Citroen have participated in the event. Car races were first organized in the heart of Moscow back in 2008, and more than 300,000 people came to enjoy the show in 2010.